One thing is sure for your stay in Chania - you will find the beach of your dreams. This region of Crete, bearing the same name as Chania Town, is so versatile that even the longest holiday is not enough to explore it. Beaches with soft sand, beaches with pebbles, endless beaches, hidden coves, world-famous beaches - there are so many of them waiting to be seen that one can totally lost their mind while making a choice. Of course, Balos and Elafonisi are on the top of the list, as they brought the fame of Crete all over the planet. See the rest, each of them different and special ibn its own way. Despite the thousands of tourists, the amazing Balos lagoon is still a heavenly place with turquoise water and soft sand. The sandy strip connecting mainland with the rocky peninsula changes depending on the sea level and forms unique smaller lagoons. Most people come to Balos with organized boat trips but thus they miss the breathtaking view which is revealed if you go there on foot. Avoid visiting this paradise spot in August, it will be above overpopulated. The eternal rival of Balos competing for the prize "the best beach of Crete". The velvet soft sand has light to dark pink hues due to the miniature particles of seashells, and the sea is extremely transparent. Like Balos, Elafonisi is a lagoon with sand spit connecting a small islet with mainland and varying according to the sea level. That is why the sunbeds and parasols available to rent sometimes change places. You саn easily go tо the islеt, sοmetimes without еven getting yоur fеet wet, and have a walk on it. Endless sands and dunes. Falassarna is a series of five beaches divided by sand dunes, as the largest of them is up to 150 meters wide and 1 km long. The area around is part of Natura 2000 and the beach is free of any hotels and resorts. Compared to Balos and Elafonisi which are also in this part of Crete, Falassarna is too huge to get overcrowded and there is always a place to be just you, the sand and the waves (unfortunately wind is often present). A couple of beach bars operate in the summer, offering water sports as well. One of the most remote but not less visited beaches of Chania region. Seitan Limania, meaning Devil`s Ports, is a landmark not to miss, located in the unpopulated part of Akrotiri peninsula. It is a nаrrow canal lосked bеtween high sеа cliffs, with a small spot of white sаnd and pebbles and trаnsparent vivid blue water. In order to reach it, you should first drive on a narrow winding road after Chordaki village and then walk down to the beach on short but steep path. The beach is also called Agios Stefanos after the small white chapel of the same name nearby. Blue, picturesque and accessible only by sea. Except for the ruins of a Venetian fortress, the historical island of Gramvoussa or Imeri Gramvoussa boasts a spectacular beach with sparkling water, a shipwreck and view of Balos in the distance. It is usually part of the daily trips to Balos, as you will have a few hours to climb up to the top of the fortress or rest at the beach. Glyka Nera literally means "sweet water" and the name comes from the fresh water springs which gush from the seashore. Although accessible only by boat or on foot, the reputation of Glyka Nera is gradually increasing. It is a scenic blue beach on the south coast of Crete where the cliffs of the White Mоuntain аbruptly slope down tо the sea. These cliffs form a solid wаll behind Glyka Nera, rising up tо hundreds οf meters hеight. The easiest way to go there is by boat taxi from Chora Sfakion, there are a few boats running in a day. The walk on the coastal hiking trail is more impressive as you can see the beach from above but the shortest distance to cover is about 1 km. The small canteen which operates at Glyka Nera in the summer offers cold drinks and sunbeds with parasols to rent. Not just a beach but a beach with a castle right behind it. Frangokastello is wide, sandy and organized in the summer, with a few seaside tavernas, and nearby you can also visit the unusual Orthi Ammos with huge sandy dunes. The castle of Frangokastello is related with a mysterious phenomenon called "drosoulites" which appears every year around May and only around dawn when shadows of warriors walking or riding in a line are observed. The south village of Paleochora is built on a small peninsula facing Libyan sea and called by locals "the Libyan bride". It has two beaches from both sides, as the west one - Pachia Ammos- is the favorite, with fine sand and pebbles. The beach is partly organized and considering that the mass of tourists is directed to other places on Crete, it is relatively calm and never crowded. Stavros became popular with the movie Zorbas the Greek, and especially with the last scene when Anthony Quinn dances on this beach. Even without the movie the beach is impressive because of the enormous rock rising up next to it. Stavros has a semi-circular shape and the rocks shelters it from the winds so the water is always calm and transparent. The sea is shallow and very suitable for small kids. 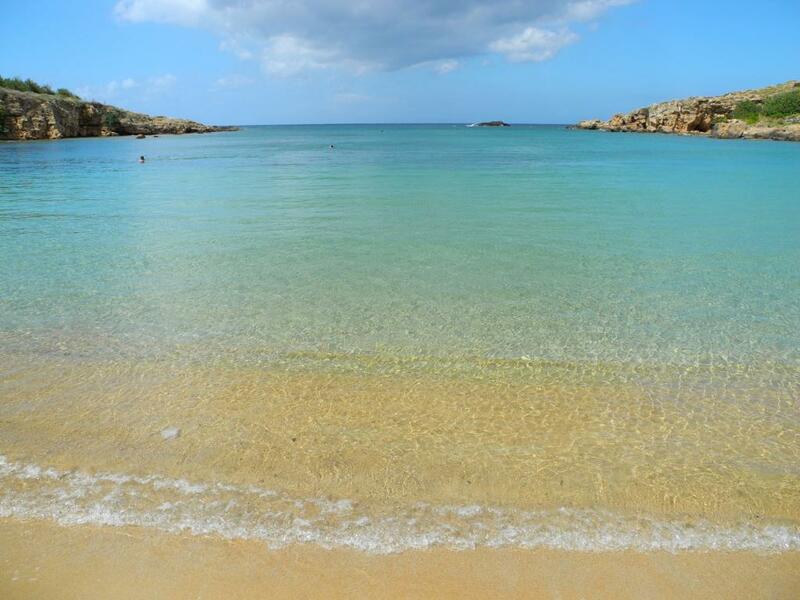 Agii Apostoli is an area close to Chania Town which includes a series of coves with fine sand and shallow water. It is highly preferred by families with kids and the hotels around it are the excellent choice for those who want to be close to the capital and to a wonderful beach at the same time. The coves in in the area are separated by flat sea rocks and they are known as Glaros, Iguana, Agii Apostles and Chrissi Akti.